The toughest thing that people tend to forget about the undeath of a skeleton is the fact that they’ve got absolutely no protection from the chilly winds of the fall and coming winters. No meat on their bones to keep them from clattering and not even any skin to block those gusts from chilling them literally to the bone. You might be thinking, Hey, what do they need to keep warm for!? but that is just the kind of privileged thinking that turns a good-intentioned skeleton into a hostile one, seeking out life force in order t give it a moment in the sun. Fortunately, we have just the thing to help you bony folks to keep yourselves warm without denying your own inner nature. 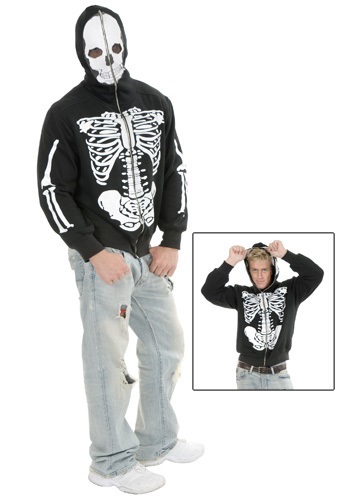 You can step into the light with this Skeleton Hooded Sweatshirt. This zip up hoodie is 100% polyester knit and has a soft fleece inner lining that will make it absolutely sinfully comfortable while warm against your version of a body. The hood can be fully enclosed with the extended zipper to show off your skull, leaving visible space through mesh eye holes. Stay warm and show off those warm bones with no fear of the bitter wind!